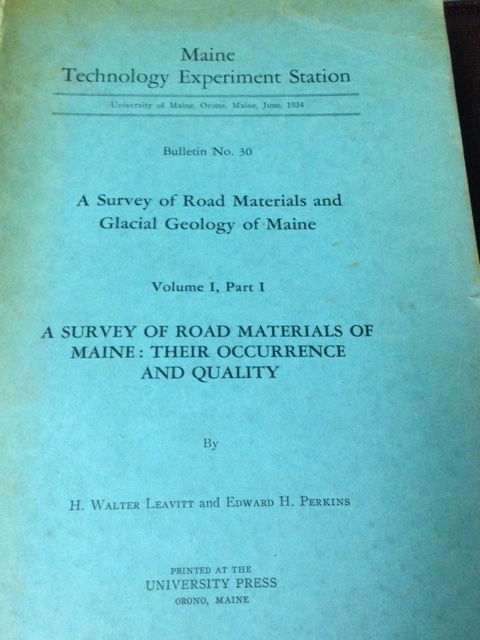 A Survey of Road Materials and Glacial Geology of Maine, Vol I, Part I. Published by the University of Maine. 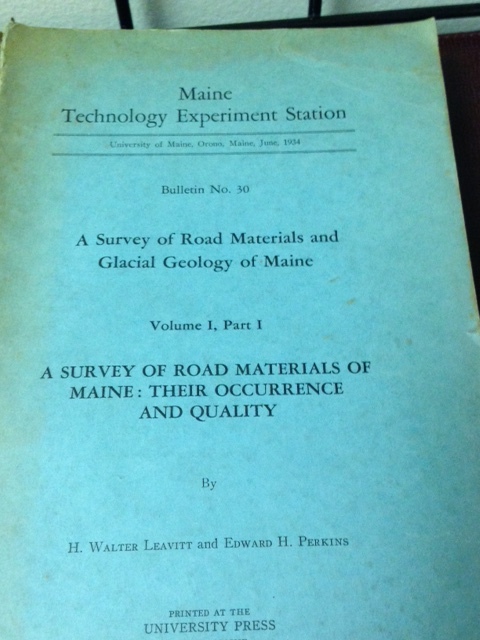 Subject/Topic: A technical book described as “a survey of road materials of Maine – their occurrence and quality”. Special Attributes: Lists of road materials by town for every town in Maine. Also, charts & tables. Condition: Fair to good condition; the binding is intact but the book has clearly been used in the field. Our Price: $49.95 plus State of Maine Sales Tax of $2.75 = $52.70. Location: This book can be found at Heritage Books & Maps, 5 Park Street in Lewiston. Our hours are generally Fridays from 10:00-2:00 and Saturdays from 2:00-5:00, although we may be available at other times, especially if Heritage Collectibles (around the corner at 189 Main Street) is open. Shipping & Delivery Information: Can be sent via the USPS’s “Media Mail” which takes about a week or so, for $3.95. Otherwise, please see our “Details: Shipping & Delivery” page. Don’t forget to sign up for our blog at http://heritagecollectiblesmaine.com so you can get all the most recent information and updates! This entry was posted in Books & Literature - All On This Site, Books - Maine & Local, Books - Reference, Maine and tagged geology, glacial, glacial geology, Maine, Maine geology, Maine road materials. Bookmark the permalink.